Find places to stay in Downey, CA and other fun things to do. View our list of attractions, activities, events, restaurants and visitor information. A handy location near the freeway reasonable rates and on-the-house internet access makes the Chateau Inn and Suites Downey a deal for budget-minded travelers. Free Internet,Outdoor Pool, Non Smoking Rooms. Reasonable rates make the Days Inn Downey a sweet deal and freebies like Wi-Fi and on-site parking make it even sweeter. The Days Inn has up-to-the-date amenities like 37-inch flat-panel TVs with premium cable channels and free Wi-Fi connections. Free Internet, Free Breakfast, Non Smoking Rooms. Disneyland is less than 30 minutes' drive from this hotel. All rooms feature cable TV with HBO film channels and free WiFi.The classically furnished guest rooms offer a work desk and a seating area. Suites feature a spa bath at Downey Inn Luxury Suites. Free Internet. 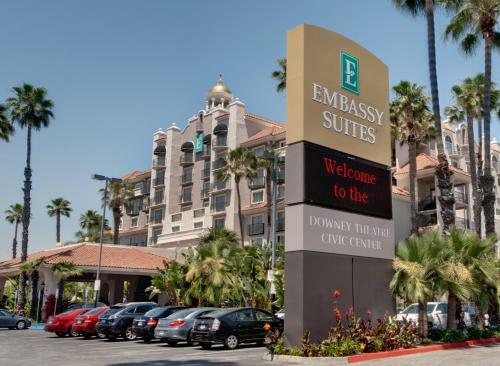 A complimentary local shuttle gorgeous indoor pool and well-stocked fitness room: no wonder the Embassy Suites Hotel Los Angeles-Downey is one of the area's most popular hotels among our guests. Swimming Pool, Indoor Pool, Non Smoking Rooms. A convenient location near major freeways plus free Wi-Fi and breakfast are among the selling points of the non-smoking Quality Inn Near Downey Studios. Free Internet, Non Smoking Rooms. Currently as low as $87.16/night! An affordable price tag is the main draw at the Regency Inn & Suites - Downey which also offers on-the-house extras like a complimentary breakfast buffet and internet access. Free Internet,Outdoor Pool, Non Smoking Rooms. Reasonable rates await at Studio Inn and Suites which also features money-saving extras like free continental breakfasts internet access and on-site parking. Free Internet,Outdoor Pool, Non Smoking Rooms. Located in Downey Sun Light Motel offers air-conditioned rooms with free WiFi. This 2-star hotel offers a 24-hour front desk.All units in the hotel are fitted with a flat-screen TV. All rooms come with a private bathroom with a shower. Non Smoking Rooms.